We understand that having a fast and reliable data connectivity solution is more important than ever. Equally, there is no one-fits-all solution, as every organisation has different individual requirements in terms of business objectives and existing infrastructure. We offer bespoke solutions that do not only seamlessly fit into your business but also actively support its wider strategy. Our service is guaranteed, as many solutions come with 24/7 support and 100% SLAs. A dedicated, high-speed, high-performance connection. Great for VoIP and Videoconferencing. Broadband delivered over traditional copper lines. ADSL2+ works on the same principle as ADSL but offers faster download speeds. Great as a replacement for ISDN. 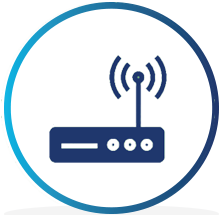 A cost-efficient, quick to install, uncontended service using existing Broadband and Ethernet networks. VoIP and Cloud friendly. Fast upload speeds and a high-bandwidth performance at an affordable price. This fibre connection links the exchange to the street cabinet. Embraces VoIP, video conferencing and other productivity applications. Using bundles of copper pairs, EFM delivers a similar service to a Leased Line, but at a lower price. Ideal for VoIP and Cloud applications. 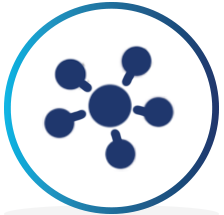 A dedicated and private network, within one or several sites. Ideal for sharing data securely and efficiently. A network joining two distinct points in a closed, highly secure manner. Ideal for organisations who transfer sensitive data between sites.